The rise in university tuition fees in England is having an impact on applications, an expert panel has said. The Independent Commission on Fees says there has been “a clear drop” in English students applying, compared with those from the rest of the UK. The panel, headed by writer and academic Will Hutton, adds there has been no relative fall in applications from poorer areas. Ministers say there is still “very strong demand” for university. The Independent Commission on Fees is supported by the Sutton Trust, a charity which aims to improve educational opportunities for young people from disadvantaged homes. It is examining the impact of the increase in fees, especially on those from poorer backgrounds. Panel chairman Will Hutton, who is an Oxford college principal, said: “Although it is too early to draw any firm conclusions, this study provides initial evidence that increased fees have an impact on application behaviour. “There is a clear drop in application numbers from English students when compared to their counterparts in Scotland, Wales and Northern Ireland. In its first report, the panel draws on statistics from the university admissions service Ucas, as well as a survey of the attitudes of some secondary school pupils. The latest figures from Ucas, for June, showed applications from people in England were down 10% on the same time last year. In Wales, the drop was 2.9%, Northern Ireland 4.5% and Scotland 2.1%. The panel says extra analysis by Ucas showed that for 18-year-olds, there had been “no significant changes” in the application rates to highly selective universities this year compared with what would have been expected from previous years. 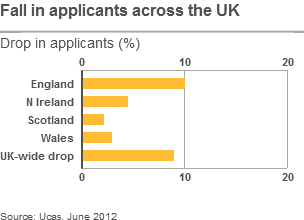 The panel mainly compared Ucas application figures from this January with those of the past three years. The report said the fact that there were fewer 18 and 19-year-olds in the population this year accounted for some of the fall in applications, but not all. And it estimated that about one person in 20 who would have been expected to apply to university in 2012 (if the recent trend of increasing application rates had continued) did not do so. “This equates to approximately 15,000 ‘missing’ young applicants,” the report said. Universities Minister David Willetts told the Today programme on BBC Radio Four there was still “very strong demand” for a university education. “We do accept that after a peak last year, applications are down from 31.6% of people applying to university to 30.6%,” he said. Last year, record numbers applied to UK universities. The University and College Union (UCU) said the figures were worrying. The union’s general secretary, Sally Hunt, said: “Young people not applying for university have few other opportunities with levels of high unemployment and the difficulty securing other forms of education or training. City and Guilds, the body behind many vocational qualifications and apprenticeships, says it has seen a dramatic rise in applications to higher level courses. It says more than 700 people have registered to do level four courses (equivalent to post-A-level qualifications) this year – up from just under 300 last year. Fees rise to a maximum of £9,000 a year at English universities from this autumn. They had been just over £3,000 a year. Students from England will face higher fees wherever they study in the UK. Mr Willetts said the new system was fairer. The government says no-one should be put off going to university because of finances, because fees will be covered by student loans which will only have to be paid back gradually if and when a graduate begins to earn more than £21,000 a year. It says there are no “up-front fees” and monthly payments on loans will be lower than they are now. The other panel members are Stephen Machin, professor of economics at University College London, the broadcaster Libby Purves and Sir Peter Lampl, chairman of the Sutton Trust.